Are Dispensationalists right to reject Replacement Theology? Yes…. and No! There is a true Replacement Theology – and a false one! As we have noted, the Jew / Gentile distinction in regards to the promises of God is fundamental to Dispensationalism. Go back and read installment #2 to refresh your mind on how critical this distinction is. Were the Dispensational world to admit that the church was foretold as the fulfillment of God’s promises to Israel found in the Tanakh, that paradigm would basically cease to exist. I want it clearly understood that there is a type of Replacement Theology that is in fact un-Biblical, wrong, and I would even say, dangerous. It is the view expressed by Postmillennialist Boettner and others. Boettner says: “The Old Testament was made exclusively with Israel, the New Covenant was made exclusively with the church” (Lorraine Boettner, Four Views of the Millennium, (Downers Grove, InterVarsity,1977)97). He also says:: “For information concerning the first coming of Christ, we go to the Old Testament. He came exactly as predicted, and all those prophecies were fulfilled or were forfeited through disobedience. But for information concerning his Second Coming and what future developments will be, we go only to the New Testament” (P. 102) . Amillennialist Kim Riddlebarger says: “Because of Jesus Christ and his coming, the Christian possesses the complete fulfillment and blessings of all the promises of the messianic age made under the old covenant. But, the arrival of the messianic age also brought with it a new series of promises to be fulfilled at the end of the age. The fulfilled promises pointed to a more glorious and future fulfillment. This is called the ‘not yet’ or future eschatology. It is this already/not yet tension which serves as the basis for understanding much of the New Testament eschatological expectation” (Kim Riddlebarger, A Case for Amillennialism: Understanding the End Times, (Grand Rapids, Baker, 2003)61. I would suggest that these views could not possible by more misguided. As we have seen, Paul affirmed that his gospel – his eschatology – was nothing but the hope of Israel found in Torah, God’s promises made to Israel. So, on this level, I would agree with the Dispensationalists that the Replacement Theology espoused by some, a theology that posits the total failure of Israel, and the establishment of the church as the replacement of Israel, based on different promises, is wrong and un-Biblical. However, I do not believe in this kind of “Replacement Theology.” I believe in, and teach, Fulfilled Eschatology – the fulfillment of all of God’s promises made to Old Covenant Israel in Torah. God was faithful to His promises to her, he fulfilled all of His promises to her. But, this is where the Dispensationalists do not grasp the nature of God’s promises to Israel. They fail to see that virtually everything about Old Covenant Israel was typological, it was a “shadow”; it was not – ever – the ultimate expression of God’s plan! 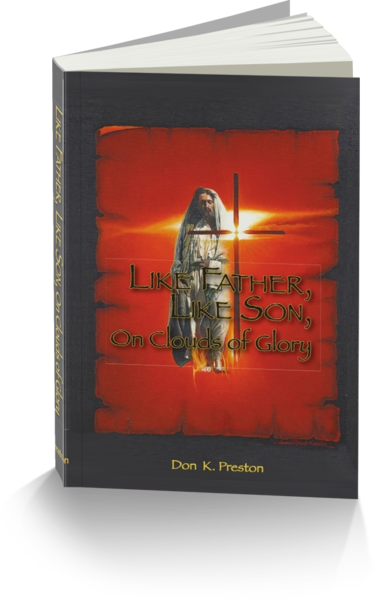 See my book, Like Father Like Son, On Clouds of Glory, for a full discussion of this critical issue. A look at Replacement Theology in light of Israel as a shadow of better things to come! God’s Form of Replacement Theology – A Wonderful Thing! Dispensationalists fail to see that God had always – always – promised that the Old Covenant form of Israel was to pass away, and she was to be transformed – through resurrection – into the New Creation, the New Man. Notice just a few examples of this. Jeremiah 31:29f – God promised to make a New Covenant with Israel. That covenant would give what Torah could not give – life and righteousness (Galatians 3:20-21/ Hebrews 8:6f / 9:15). Now, is this Replacement Theology? On one level it certainly is, but, it is replacing the old, ineffective covenant with the better covenant! Is that a bad thing? No, this is the best kind of “Replacement Theology” imaginable! See my brand new book, The New Covenant: Fulfilled or Future? for a very important study of the critical issue. Isaiah 28 – The Lord promised that He would lay the foundation of the Messianic Temple with the precious Corner Stone! This New Temple would in fact “replace” the Old, but, the change would be radical – almost beyond belief! The New Temple would be laid on the Chief Corner Stone of the Living Messiah! In other words, the New Covenant Temple would “replace” the Old Covenant Temple of marble, gold and cedar, with the Living Corner Stone of Messiah! This is the ultimate Replacement Theology but, who in the right mind would say that this would be a bad thing? Isaiah 58 – The Lord promised that in the days of the Messiah, the foreigner and the Eunuchs who had always been excluded from the Temple, would be given a place within that Temple and they would be given a name that was better than sons and daughters! Now, this is a radical Replacement Theology! It would replace the exclusionary, limited access to YHVH with a “Temple” that would –in fulfillment of Solomon’s prayer much earlier (1 Kings 8) be open to all men of every nation! Isaiah 60 / 66 – The Lord promised that the priesthood would no longer be confined to the Levitical tribe, but that the time was coming when even foreigners would be able to offer acceptable sacrifice on His altar– He would “make them to be Levites.” So, is replacing the restricted and restrictive exclusively defined priesthood with the priesthood of all believers something to be viewed as somehow anti-Semitic and evil? If so, then you have to accuse Paul of that since he (and John and Peter) believed that the New Priesthood of believers had arrived, and it was a good thing (Hebrews 13:15)! Malachi 1:11f – God promised that the venue of worship would be radically changed. Instead of one central strictly limited location where acceptable sacrifices could be made, YHVH said the time was coming when men could offer praise to Him in all places – any places! Now, that is a Replacement Doctrine directly from YHVH. Is that a bad thing? These are but a few of the Old Covenant promises that foretold the “Replacement” of the Old Covenant realities of Jesus. There are several other prophecies that anticipated, yes, the “Replacement” of the Old Covenant, exclusive people! YHVH had always promised to create a New People (Genesis 28:15f / Psalms 102 / Isaiah 43). Israel’s “day in the sun” as the exclusive people of God would come to an end. He would create a New People, with a New Name, in the New Creation (Isaiah 65:8-21)! This was God’s plan – all along! It was not Israel’s failure – it was Israel’s destiny! What cannot be missed as one examines the predictions of the “replacement” of the Old with the New is that the anticipated replacement realities are found in Christ– in his body! The New Testament writers make this abundantly clear! This is “Fulfillment Theology” not a failed Replacement Theology! This is wonderful news! More to come as we continue our investigation of the misguided myth of the Dispensational doctrine of Replacement Theology.